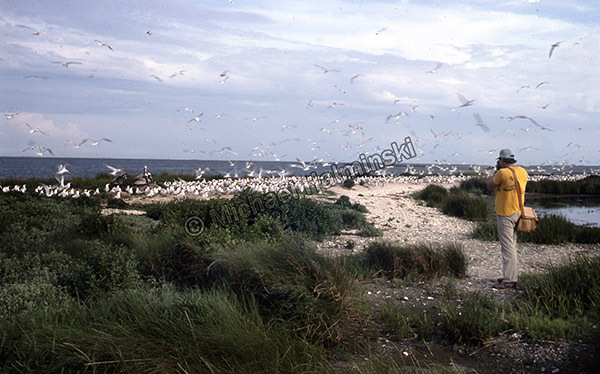 When I made Hatteras Island my home 44 years ago, there were hardly any working photographers around. The few established photographers were folks like Charles D’Amours who ran a little studio in Manteo. He and his wife also sold art supplies, and that’s where I started getting all my mat board. They were an elderly couple and several years later retired and left the scene. The most well known photographer was Aycock Brown. He photographed extensively and I regarded him more of a publicist than an artist. He shot social events and could always be spotted at the marina when charter boats arrived. His straw hat was a signature trademark and his images have become an important historical record of times gone by. I can still see him peering down into the viewfinder of a Yashica twin lens reflex. In Buxton, Ray Couch owned and operated The Red Drum. It was a full service gas station and tackle shop. Located near Cape Point, he specialized in recording fishermen’s catches. 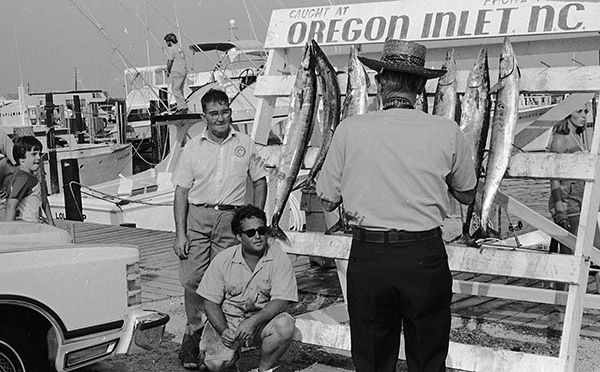 His photographs promoted the island’s great fishing and doubtless brought many anglers to Hatteras Island. My understanding is that much of his work was either lost or destroyed. Then there was Jim Lee. Anyone taking pictures here at that time was sure to know him. He had the only camera store within 50 miles. Jim’s Camera House was where we all went to buy film, chemicals, cameras or to have film processed. I think Jim took pride in being a sage, elder statesman of local photographers. It was the gleam in his eye that said it all. Henry Applewhite was another. He lived in Manteo and did mostly commercial photography using medium format. I remember watching him do some advertising food shots with studio lights at the Seafare Restaurant, where I worked briefly as a dishwasher. A photographer that really caught my eye though was Foster Scott. He was about my age and was fully involved doing promotional work for the Dare County Tourist Bureau. His pictures were always in the Coastland Times and they stood out both from a technical and artistic perspective. He was a master at photographing people, scenery and landscapes. All these photographers were shooting almost exclusively in black and white. I aspired to shoot and print in color, and good fortune connected me with Ray Matthews. He also worked at the Seafare Restaurant as a waiter. We hit it off becoming close friends, and we both desired to make photography our life’s work. It was fortuitous that our birthdays landed on the same day. Ray and I frequently celebrated our birthdays together. 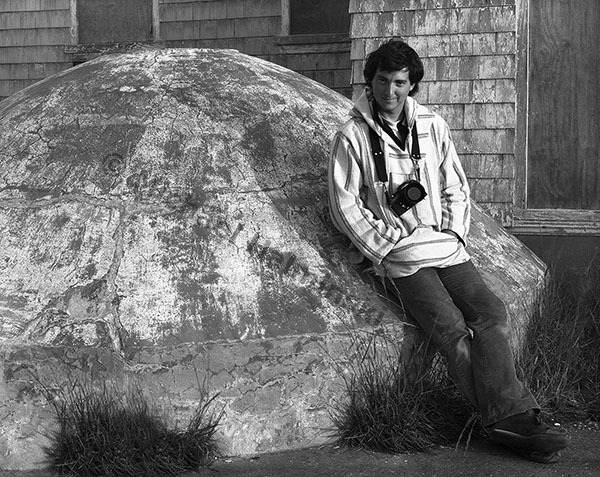 On that day in 1979, I made his portrait with a 4×5 view camera alongside a water cistern at Chicamacomico Lifesaving Station. In 1980, Ray Matthews, Foster Scott and I embarked on a 3-day camping trip to Beacon Island in Pamlico Sound. From our base camp there, we made excursions in a 14 foot skiff to other islands, including Portsmouth Village. 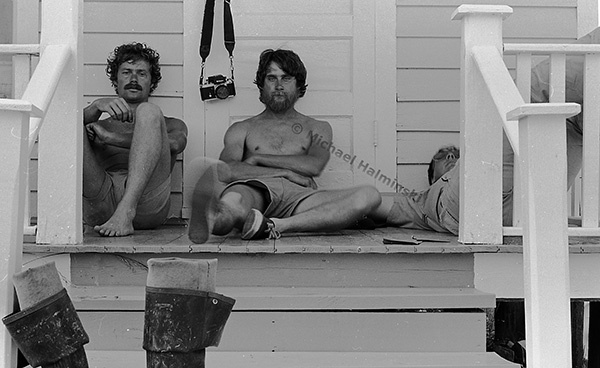 I used the self-timer on my Nikon F2 to make this shot of the 3 of us resting on the front porch of the Henry Pigott house. Foster is on the left with me in the middle, and Ray crashed out on the right. We were famished. This shot of Ray was taken on that same trip. Sometimes we worked in the same competitive market, but over the years, Ray has been a big influence on my own photography. Another photographer soon began to make his mark on the Outer Banks. Drew Wilson worked as a staff photographer for the Virginia Pilot. I admired his coverage of the region, and I still regard him as one of the best. In 1986, I made this photo of him while he was shooting an assignment about bird banding. 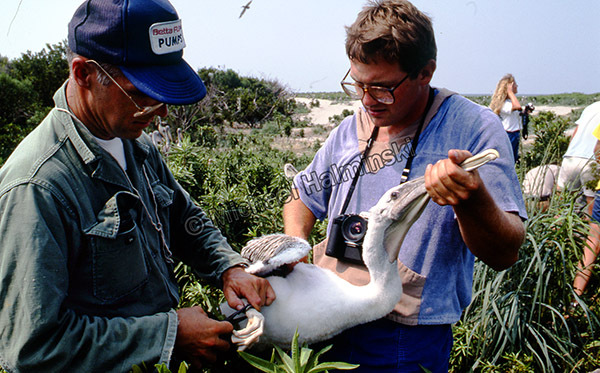 Totally immersed in his subject, he worked hands-on handling this young pelican while John Weske crimped a band over the leg of the bird. Drew has since moved on to the New Bern area for his journalistic work. Now in the digital age, photography has spread to the masses. Today everyone can be a photographer, however making it a livelihood is another thing. This entry was posted in black & white photography, history, Outer Banks, People on November 23, 2017 by j0jgvm89bj.